Of all the eminent Edo Period Japanese artists being celebrated this year, the honors have definitively gone to the eccentric painter Ito Jakuchu (1603-1868), whose 300th anniversary is celebrated in at least four retrospectives nationwide, some recently finished and others forthcoming Artists’ reputations belong to the whirligig of time, and while the present-day Jakuchu-mania is welcomed, his contemporaries have consequently become overshadowed and the period’s diversity somewhat obscured. Yosa Buson (1716-1783) shares the birth year as Jakuchu, though the occasion is celebrated on a smaller scale. He worked in the literati tradition adopted from China at the end of the 17th century and subsequently indigenized a tradition that shared emphases on the perfections of poetry, painting and calligraphy. While Japanese practitioners frequently excelled in one art form, Buson, unusually, became the master of two. Today he is considered a haiku poet equal to Matsuo Basho (1644-1694) and a painter ranked alongside Ike no Taiga and Jakuchu. Buson became known for painting in later life. Born in Kema on the outskirts of present-day Osaka, he went to Edo (now Tokyo) at aged 20 and learned haiku under Hayano Hajin while studying the Kano school of painting — a school that received shogunal patronage. “Dancing Shizuka Gozen” (18th century), depicting a famous 12th-century court dancer and courtesan, is representative of his work of that time. When Hayano died, Buson, then 27 years old, moved around northern Japan for a decade and traced Basho’s famous journeys. After he turned 35, he made Kyoto the base of his otherwise peripatetic poetry-teaching and writing life, before settling there more permanently from age 42. 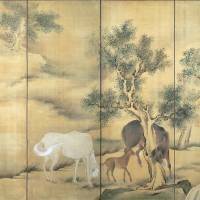 Buson refined his Chinese-painting skills, as can be seen in the set of screens “Wild Horses” (1763), taking up the realism introduced to Japan by Shen Nanping from 1731 to 1733. “Landscape after Qian Gong” (18th century) conflates geographic and cultural references: On the one hand, Buson’s Chinese-painting-style depiction of Mount Zozu names the elephant-head-shaped mountain in India where Sakyamuni Buddha (also known as Siddhartha or Gautama) had taught; on the other, it names the site of Kotohiragu Shrine in Shikoku, which Buson himself had visited. The painting was likely painted for Suga Kuroji, a wealthy merchant from Shikoku. Buson’s later “Japan-style” is visible in “The Narrow Road to the Deep North” (1778), painted at a time when Basho’s fame was undergoing a late Edo Period revival. He reproduced Basho’s famous travelogue in full by copying the 1770 published edition, but he also made alterations to the original in places, miscopied at intervals and used variant kanji characters of his own devising. He pictorialized and punctuated Basho’s verbal narrative with 13 illustrations, including ones of the farewell at outset, the hermit encountered at Sukagawa, a poetry gathering at Tsuruoka, and the courtesans of Ichiburi. The single scroll harmonized both visual and verbal components and humanized the landscape by investing it with figures. The result was a Japanized Chinese tradition in what has become an Important Cultural Property.